March is usually filled with madness, but as this year's Sweet 16 approaches, the field that has been whittled down from 68 teams remains chock-full of star power. All of the No. 1, No. 2 and No. 3 seeds won on the first weekend of the NCAA Tournament and a number of other contenders are still around. That doesn't mean, however, that potential upsets aren't awaiting us. The Sweet 16 has traditionally been a little quieter when it comes to bracket-busting stunners than, say, the opening round. But there have still been some eye-openers over the years, including in 2018's tournament, when both a No. 11 and No. 9 seed moved to the Elite Eight with thrilling victories. Start a bracket pool to compete against friends or play for the chance to win a college basketball dream trip.Get in the action today! This is the only upset on the list that predates the NCAA's 1985 expansion of the tournament to 64 teams. In fact, when North Carolina took on St. Bonaventure in 1968, there were just 23 teams in the bracket, with the Tar Heels and Bonnies squaring off in the East Regional -- two of 16 teams remaining. Without star Bob Lewis for the first time in years, UNC put a dent in St. Bonaventure's perfect 22-0 record, and it did it convincingly, besting All-American Bob Lanier and Co. by 19 points. Fresh off upsets of No. 6 Michigan State and No. 3 North Carolina, George Mason continued its improbable run against the Shockers by -- wait for it -- shocking their competition with stingy defense. Holding Wichita State to just 19 first-half points, the Patriots led by as many as 19 points at one point, extending their first-ever NCAA tourney run by spitting in the faces of critics who failed to give them a single Top 25 vote during the season. Defeating an eight-time national champion is one thing. Doing it as one of the worst-rated teams still alive in the tourney is another. That's exactly what K-State did during a riotous 2018 Sweet 16 in which Barry Brown Jr.'s last-minute shot -- and some Kentucky misses -- denied coach John Calipari a chance at his fifth Final Four appearance in nine seasons. Out-rebounded and inefficient from the floor, Kansas State used defense to lock down Calipari's freshmen and storm into the Elite Eight. Still reeling from the death of 23-year-old Lions player Hank Gathers, Loyola Marymount became the first West Coast Conference team in more than 30 years to advance to a regional final thanks to its thriller against the Crimson Tide. Down eight with eight minutes to play, the team survived an Alabama jump shot at the buzzer -- and its lowest point total of the season -- to steal a victory. Appearing in the Sweet 16 for the first time in 33 years, the Ramblers took another step in their improbable 2018 run -- with Sister Jean in tow! 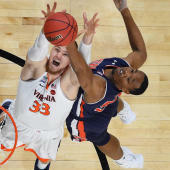 -- by downing the Wolf Pack with heroics from Marques Townes, who entered the game having scored just 15 points in the team's first two tourney games. With Loyola-Chicago up by just one with 6.3 seconds remaining, Townes drilled a 3 in front of his own bench, securing the Ramblers' latest dance into history. Xavier earned its first trip to the Elite Eight in nearly a decade by stymieing one of the NCAA's top offensive teams in Arizona, which led by eight with four minutes to play. Thanks to a 9-0 run to close the game, the Musketeers not only disposed of one of the nation's most recognizable programs, but they added to a storybook tourney run that began after a six-game losing streak -- and the loss of point guard Edmond Sumner -- late in the season. After barely escaping Charleston, Arizona wasn't much of a favorite vs. the Jayhawks in this one, especially considering it was going up against a star-studded five-man lineup featuring Paul Pierce and three other future NBA players. Yet it was the Wildcats -- not Kansas -- who kicked off a title run with this matchup, avenging a Sweet 16 loss to Kansas the year before by clinging to a tight first-half lead and getting at least 17 points from three different starters -- Mike Bibby among them. Everything from transfers and suspensions to a chickenpox outbreak threatened LSU's chances of contending in 1985-86, but the Tigers proceeded to become the first double-digit seed to reach the Final Four by knocking off future NBA stars Mark Price, John Salley and the Yellow Jackets. After taking a six-point first-half lead, LSU hung on with a game-leading 27 points from Don Redden, and its victory stood as the only Sweet 16 win by an 11-seed team for two decades. You could make an argument for this one as No. 1. Indiana entered under second-year coach Mike Davis as a clear-cut underdog, and when the Hoosiers fell behind by 17 points, Duke's No. 1 seed seemed very appropriate, especially with coach Mike Krzyzewski touting a roster that rivaled his defending championship team. But behind sophomore Jared Jeffries, who exploded for 24 points and 15 boards, Indiana stormed back and rode its momentum all the way to the national title game. The Hoosiers might have immortalized themselves by dethroning Duke, but Missouri did something even more unprecedented when it ousted UCLA that same day. It became the first No. 12 seed to ever advance to the Elite Eight. And it did it against what some people called "the most talented eight seed ever" -- a UCLA team that ranked as high as No. 3 during the season. Twenty-three points from Clarence Gilbert helped the Tigers erase an eight-point second-half deficit and reach their first Elite Eight since 1994.